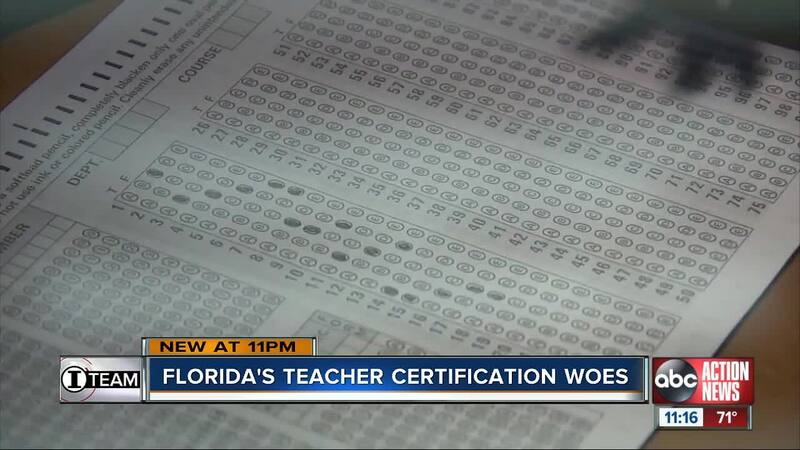 FL Lawmakers peppered state education leaders with questions on Wednesday about a state teacher licensing exam we’ve been reporting on for two years. Investigative Reporter Katie LaGrone reports from Tallahassee. Florida lawmakers sought answers on Wednesday to some of the same questions we’ve been asking for two years. At issue, Florida’s Teacher Certification Exam (FTCE). The FTCE is the state’s must-pass teacher licensing exam. It was revised in 2015 and made tougher to better align with more rigorous students test. But since those revisions, the test which also includes a controversial General Knowledge (GKT) section, has resulted in higher failure rates, more teacher terminated for not passing the GKT and school districts struggling to fill the gaps. “We’re still missing about 250 teachers,” said Kamela Patton, Superintendent of the Collier County school district. Patton and several of her colleagues made a special trip to Tallahassee to speak with lawmakers about the need to recruit and retain teachers. The FTCE has contributed to the district’s teacher troubles. “It adds to people not wanting to even come into the field,” she said. Jessica Janisewicz spoke to lawmakers on behalf of the Florida Association of School Administrators, a group that advocates on behalf of school principals. “It’s huge for our members. It’s something they’ve been discussing for the last few years,” she said. Phil Canto, Director of Teacher Certification for the FL Department of Education clarified details surrounding the tests, its revisions and subsequent failures. He explained that the test is designed and created by Florida professionals in the field of education and while the test remains in line with industry standards and best practices, the FTCE was, “not designed to measure or used to measure teacher effectiveness,” he said. RAW VIDEO | We tried to speak with FLDOE Bureau Chief, Phil Canto, after he presented to lawmakers but once again, he avoided us. Representative Anna Eskamani, a Democrat representing parts of Orlando, questions why. “We have to make sure that we have the best teachers but if the GKT [General Knowledge Test] isn’t even evaluating teacher effectiveness, then really what is the point that it serves,” she told us. Among the biggest concerns for lawmakers is costs to take the exam. Examinees pay anywhere from $130 a section to $200 and retakes are $20 more. “That was most concerning to me,” said Republican Representative Byron Donalds of Collier County. Donalds chairs the PreK-12 Quality Education Subcommittee and added teacher certification to the agenda of discussion items after watching our reports and hearing from constituents in his own district. It’s an issue lawmakers are ready to tackle to keep the right Florida teachers from leaving the classroom. “We got to have high-quality teachers that are making a real difference there, shouldn’t be a stumbling block in their way for them to continue doing that," he said.